Is there are any possibility to set pulse width for pattern? For example, i need to simulate 1kHz bus with 1us pulse width. See picture attached. Any tutorial about that? Sorry, i'm newbie here. You can use clock with 99.99% duty or configure pulse signal or custom pattern. 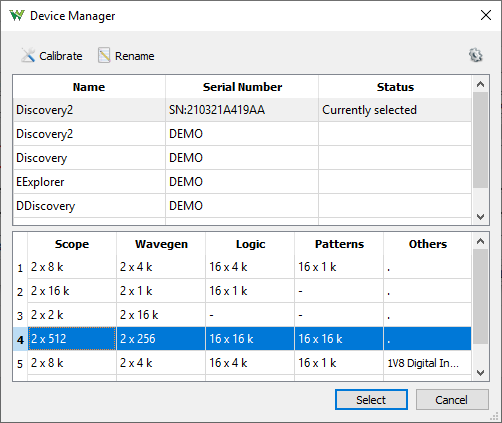 To have more buffer for custom on Analog Discovery under Settings/ Device Manager select the 4th configuration. I clearly understand, how to make sequental pulses (clock) with predefined pulsewidth. 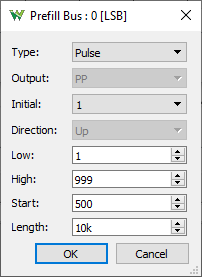 But how exactly to make custom pulse sequence/pattern (see pict attached) with predefined timing like captured? Maybe it is not even possible? Select file, check column for signal adjust frequency as it was in Logic Analyzer. Do the same for the other signal. Select Auto Run and Repeat 1, or leave it with continuous if you need this way. Yes, it works! Export-Import super useful feature missed somehow ! But my question remains, how it possible to setup manually custom pattern with specific timings? The custom pattern can be edited in the interface, with mouse on the signal, prefill generated (pulse, random or counter fur bus), edited in the table on the right side, signal imported from csv, txt files.